I bet many of you can’t wait for the belated release of Final Fantasy XV. To ease the wait a little, parts of the original music composed by Yoko Shimomura (Kingdom Hearts, Street Fighter II) for the new chapter of Square Enix’s wonderful video game franchise, were performed live at Abbey Road last month – concluding with the grand Titan Battle Theme Apocalypsis Noctis. Yesterday, young Italian composer Alex Moukala, whose music was featured in the promo campaign for summer blockbuster Ben Hur (watch here), published a cover of the Titan Battle theme Apocalypsis Noctis. Alex Moukala augmented the track’s original epicness with strong percussion and massive hits – and it’s really impressive! Composer Alex Moukala is his natural habitat. “Truth is, I have the luck of being a professional trailer music composer who works for amazing labels, such as End of Silence and Really Slow Motion. But when I look at my music career ambitions, I have to say the biggest one would be to score a Final Fantasy game. Final Fantasy has many special meanings to me, but to make it short, I grew up playing the various chapters of the saga spending countless hours and afternoons truly immersed in those imaginary worlds. We will definitely keep our fingers crossed for composer Alex Moukala’s future career and if you do so as well or just want to learn more about the creation of similar tracks, make sure to check out the great tutorials on his Youtube channel. Head over to his Soundcloud channel if you prefer to just listen to his music. If you like what Alex does, support him on Patreon! 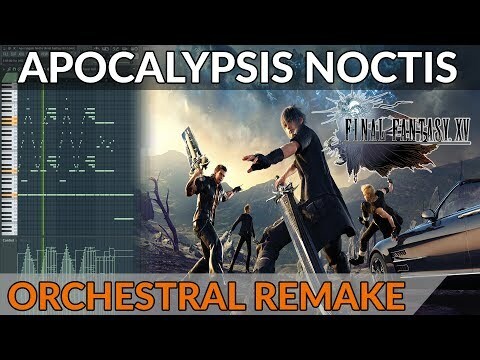 2 Comments on "Listen to an epic cover of ‘Apocalypsis Noctis’ (Final Fantasy XV)"
Wow, thanks a lot Peter for featuring the cover, and forsharing my story here on this amazing website! Very welcome, Alex, and thanks for taking the time for the little interview! Keep it up!